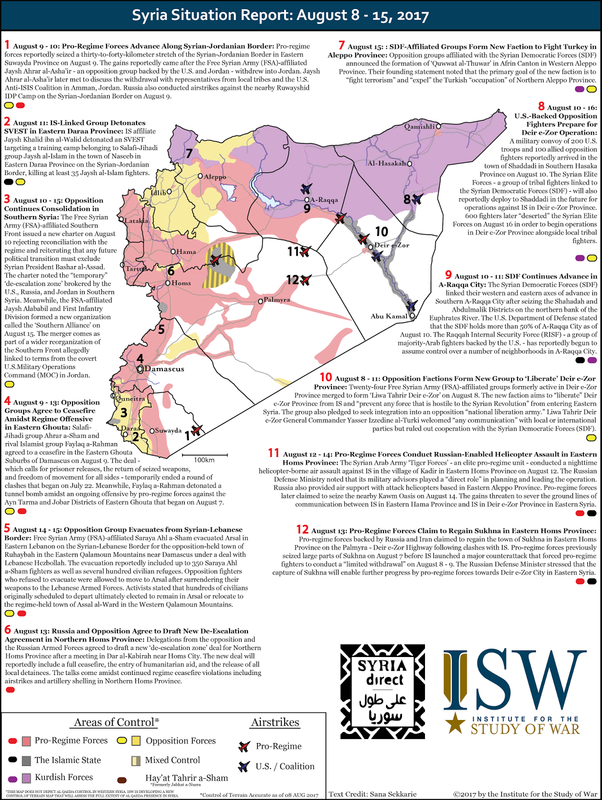 This series of graphics marks the latest installments of our Syria SITREP Map made possible through a partnership between the Institute for the Study of War and Syria Direct. 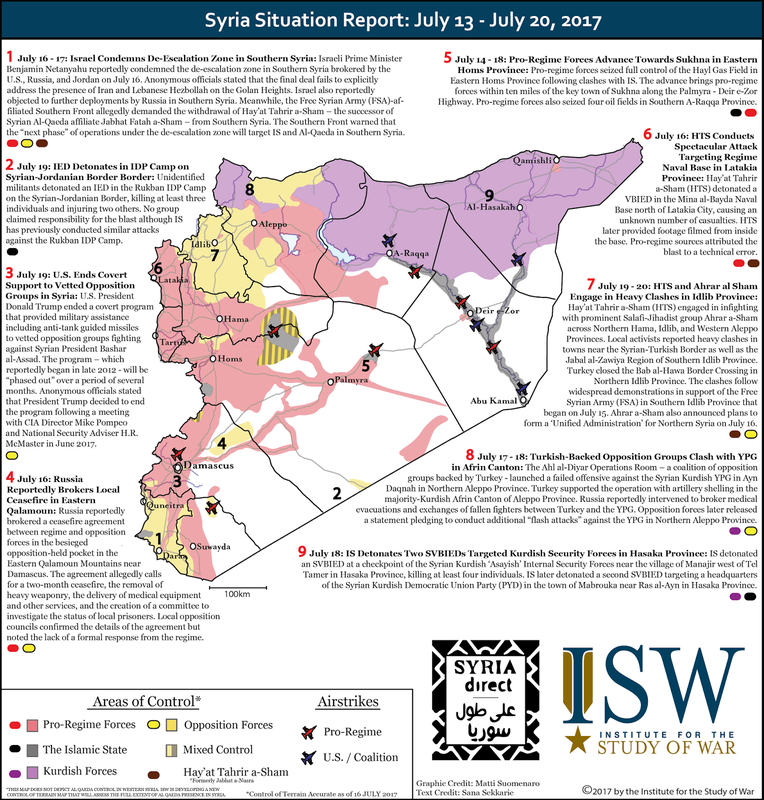 These graphics depict significant developments in the Syrian Civil War from August 8 - 23, 2017. The control of terrain represented on the graphics is accurate as of August 8, 2017. 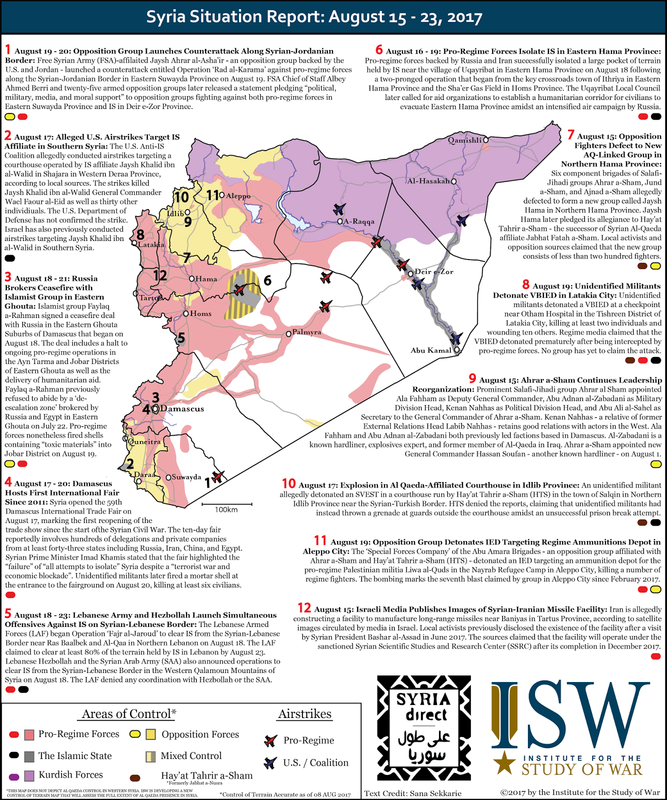 Special credit to Sana Sekkarie of the Institute for the Study of War for her contributions to the text of these Syria SITREP Maps. Russia likely perceives a requirement to subvert the Moldovan government before Moldova’s 2018 parliamentary elections or risk surrendering influence over the country’s decision-making. The broadly pro-Western Moldovan government recently took steps to curb Russia’s subversion, and expand its cooperation with Ukraine and NATO. Moldova’s pro-Russia President Igor Dodon has thus far failed to make meaningful progress in pushing Moldova into the Kremlin’s orbit. Russian President Vladimir Putin will likely attempt to destabilize the government of Moldova and empower President Dodon to reset the political situation in Chisinau in the Kremlin’s favor. The U.S. must support the forces in Moldova defending the country’s sovereignty against Russian aggression. Moldova’s pro-Russia president Igor Dodon is attempting to push Moldova into Russia’s orbit, but is facing effective resistance from pro-Western elements of the government. Dodon, Russian President Vladimir Putin’s key ally in Moldova, supports Moldova’s integration into Russia-controlled structures, including Eurasian Economic Union (EEU). He is currently unable to initiate membership talks or achieve any important progress without parliamentary support. Dodon attempted to transition the country from a parliamentary system to a presidential one in order to expand his power. The Moldovan Constitutional Court disrupted Dodon’s plan on July 27 by finding his planned September 2017 referendum on the issue unconstitutional. The pro-Western Moldovan Parliament and the Prime Minister Pavel Filip have taken decisive steps to counter Russian subversion and integrate with Western structures. The Moldovan Parliament demanded that Russia’s “peacekeeping forces,” illegally deployed in the Russian-controlled separatist Transnistria region since 1992, withdraw from Moldovan territory on July 21. Moldova also denied a number of high-profile Russians, including Russia's Deputy Prime Minister Dmitry Rogozin and a member of the Russian parliament, access to the country. Moldova also expanded its security cooperation with Ukraine. Moldova reiterated its support for Ukraine in its fight against Russia’s proxy forces in Eastern Ukraine. Ukrainian President Petro Poroshenko and Moldovan Prime Minister Pavel Filip participated in the opening of a joint border crossing designed to expand customs control and prevent smuggling, and likely intelligence activity, from Transnistria on July 17. The two governments agreed to expand that control on August 14. Moldova continues to fight the ongoing flow of Russian mercenaries to and from Moldova and Eastern Ukraine. The Moldovan government expelled five Russian diplomats on May 29, whom it accused of recruiting Moldovans to fight alongside Russia’s separatist proxies in Eastern Ukraine. The Moldovan government also continues to expand its ties with NATO, most recently agreeing to open a NATO liaison office in Chisinau. Russia views these developments, in particular, Moldova’s steps to advance its cooperation with Ukraine and NATO as a threat to its regional security interests. The Kremlin uses its illegal military basing in Transnistria to threaten Moldova, Ukraine’s western flank and NATO member Romania. The Kremlin sees Moldova-Ukraine border posts as an attempt to isolate its base in Transnistria. Russia has had difficulty moving troops and supplies into Transnistria due to its war in Ukraine, and expanding Ukraine-Moldova cooperation threatens to cut off its access to the region entirely. The Deputy Chairman of the Russian Federation Council’s Committee on Defense and Security Bair Zhamsuev said on August 08 that Russia would use military force to protect Transnistria should Moldova or the West attempt to invade it. Russia will likely escalate its efforts to undermine Moldova’s broadly pro-Western government. President Dodon’s legal options to achieve his goals are now highly limited, which is likely to prompt the Kremlin to directly subvert the Moldovan government. The Kremlin’s most likely course of action will be to use disinformation and political subversion to weaken the pro-Western government in order expand Dodon’s influence. 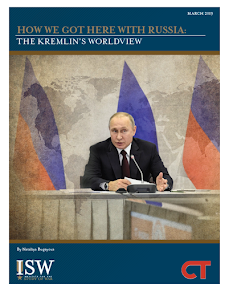 The Kremlin’s most dangerous course of action would be to use its military and intelligence forces operating out of Transnistria to destabilize and, potentially, collapse the pro-Western government ahead of 2018 parliamentary elections. In both cases, the Kremlin is also likely to frame the Western presence in Moldova as a provocation in order to justify an expansion of Russian involvement in Transnistria. Russia’s Deputy Prime Minister Dmitry Rogozin has already claimed the U.S. is training Moldovan saboteurs to infiltrate Transnistria at a military base undergoing U.S.-funded renovation in Bulboaca, Moldova on August 07. Dodon promised to watch the base for signs of a regional conflict provoked by the U.S. The Kremlin will also likely exploit the growing political tensions, rising ahead of the 2018 elections. The Moldovan Parliament passed a controversial bill on July 20 that would change Moldova to a mixed electoral system. The legislation, which was criticized for perpetuating larger parties’ control of the government, caused protests and clashes between police and protesters.” The Kremlin may use such discontent to foster further political instability. The Trump Administration must support pro-Western political forces in Moldova in their efforts to counter Russian subversion and strengthen Moldova’s internal resiliency. The US must help Moldova secure its sovereignty and territorial integrity, develop a transparent and accountable government, and deter potential Russian aggression. Such support should include a range of assistance programs, including military and border security assistance. The US must reemphasize that Russian forces are illegally occupying Transnistria and must withdraw from Moldovan territory. Russia continues to masquerade as an effective anti-ISIS actor in order to lure the U.S. into a counter-terrorism partnership in Syria. Russia seeks to leverage this partnership to expedite an American withdrawal from Syria, removing the U.S. as an obstacle to continued Russian build up and force projection in the Middle East. 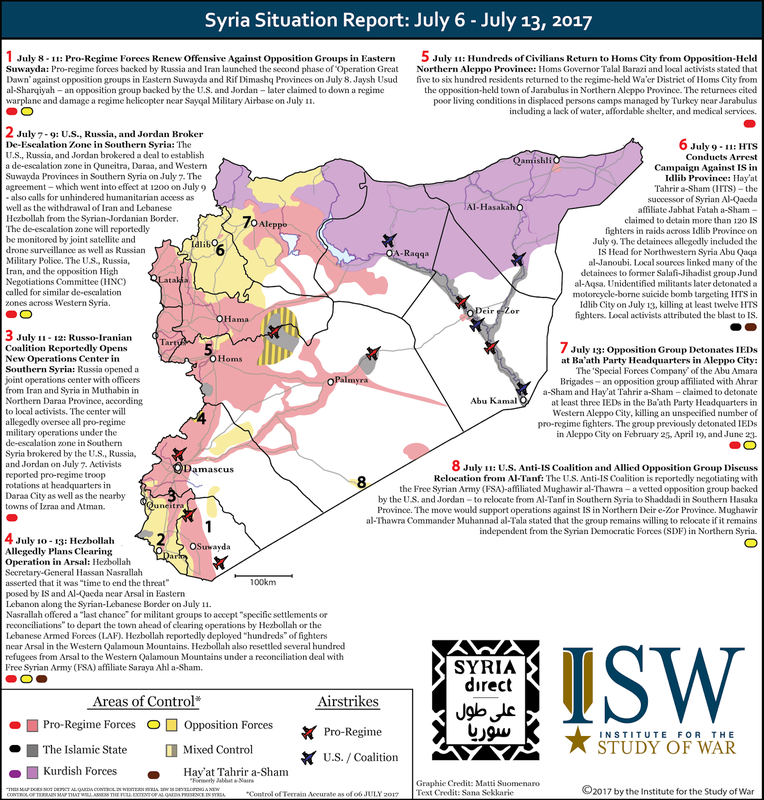 Russia may achieve short-term territorial gains against ISIS, but will ultimately undermine U.S.-led anti-ISIS efforts in Eastern Syria. 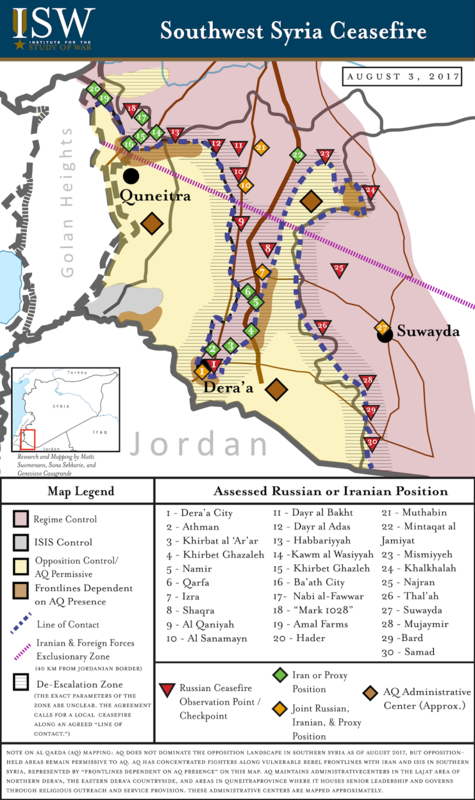 The Russian-backed campaign will fail to decisively defeat ISIS and al Qaeda in Syria, however. Russian airstrikes in ISIS-held terrain regularly targeted civilian infrastructure such as mosques, schools, and medical centers from July 17 - August 13, according to local activists. Russian airstrikes also reportedly targeted an internally-displaced persons (IDP) camp in Zour Shamar in Eastern Raqqa province on July 23 - 24. Russia’s punitive strikes against vulnerable Sunni populations will exacerbate local grievances, increase sectarian tension, and pave the way for the resurgence of ISIS, al Qaeda, and other jihadist groups in areas recently seized from ISIS. Moreover, pro-Bashar al Assad regime forces’ rapid advance in Eastern Syria may indicate the regime is not allocating sufficient time or manpower to conduct effective clearing operations. 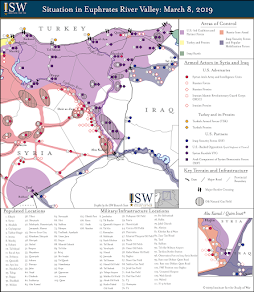 Incomplete clearing operations could permit ISIS to leave behind latent attack cells or create ISIS-permissive zones along the Euphrates River Valley. The pro-regime coalition currently lacks the manpower required to secure and hold these areas in the long-term. Iran and the Assad regime are already exploiting nascent U.S.-Russian cooperation to expand their control into Eastern Syria at the expense of the U.S. and its partners. 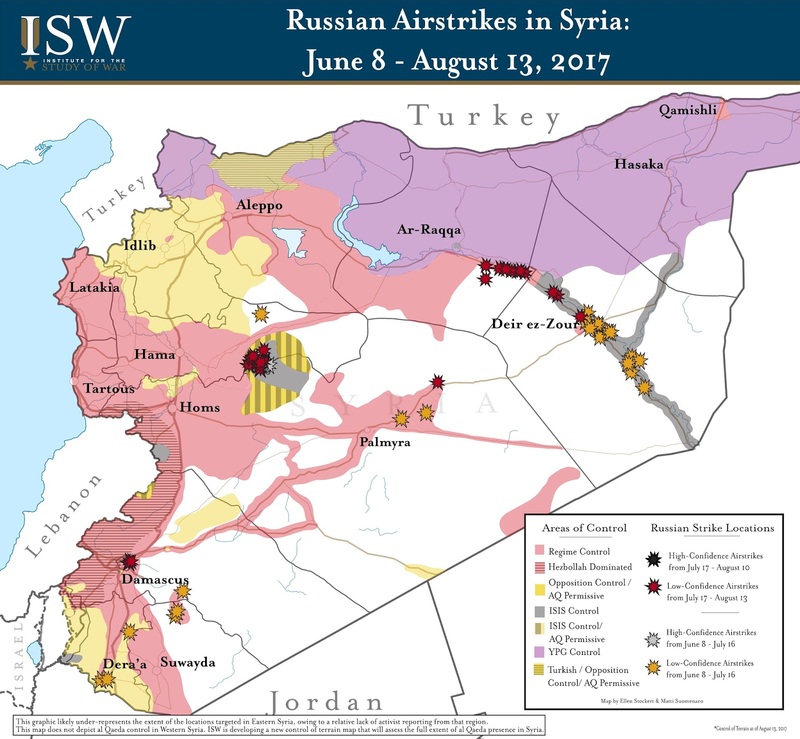 Russian airstrikes primarily targeted ISIS-held areas from July 17 - August 13 in support of Iranian and Assad regime advances. Pro-regime forces backed by Russia and Iran recaptured Sukhna, which sits on the Palmyra - Deir ez Zour Highway, from ISIS on August 13 following a wave of ISIS counterattacks against the city from August 8 - 10. Russian airstrikes also targeted villages along the southern bank of of the Euphrates River in southeastern Raqqa Province, allowing the recapture of al Numaysah, al Jaber, and al Kumaysah towns by pro-Iranian and regime forces. These gains were facilitated by manpower freed from recent de-escalation zones brokered by Russia in Southwest Syria, the Eastern Ghouta suburb of Damascus, and northwestern Homs Province. Russia, Iran and Assad seek to leverage these gains to constrain the freedom of action of the U.S.-led anti-ISIS coalition in Syria. Pro-regime positioning along the Euphrates River could block the advancement of the U.S.-backed Syrian Democratic Forces (SDF) southeast from Ar-Raqqa City after the completion of Ar-Raqqa City clearing operations. Russia’s gains against ISIS in Syria’s East will ultimately embolden Iran and the Bashar al Assad regime, rather than constrain them. CORRECTION: A previous version of this blogpost stated Russian airstrikes targeted an IDP camp in Raqqa Province on August 23-24. The correct date for the reported Russian strikes is July 23-34. 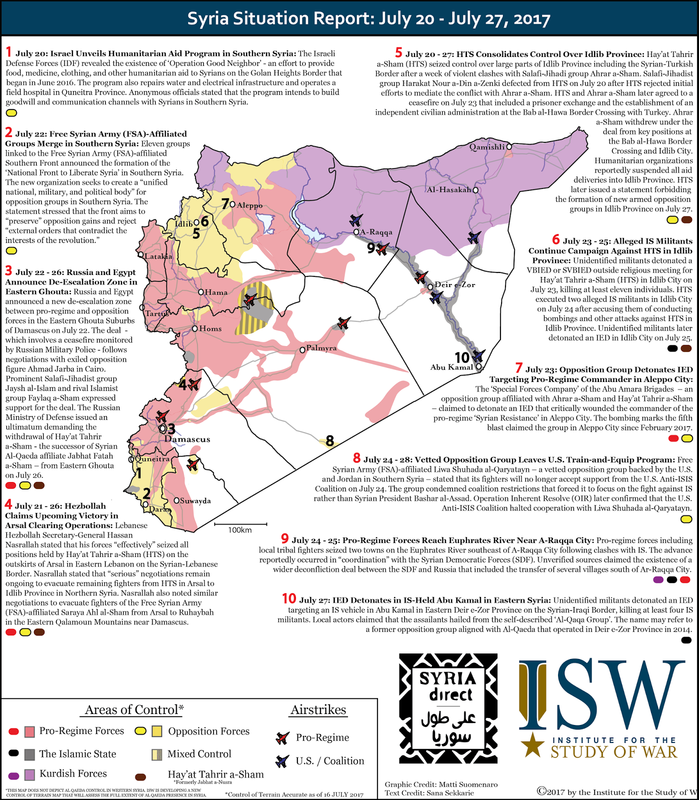 This series of graphics marks the latest installments of our Syria SITREP Map made possible through a partnership between the Institute for the Study of War and Syria Direct. 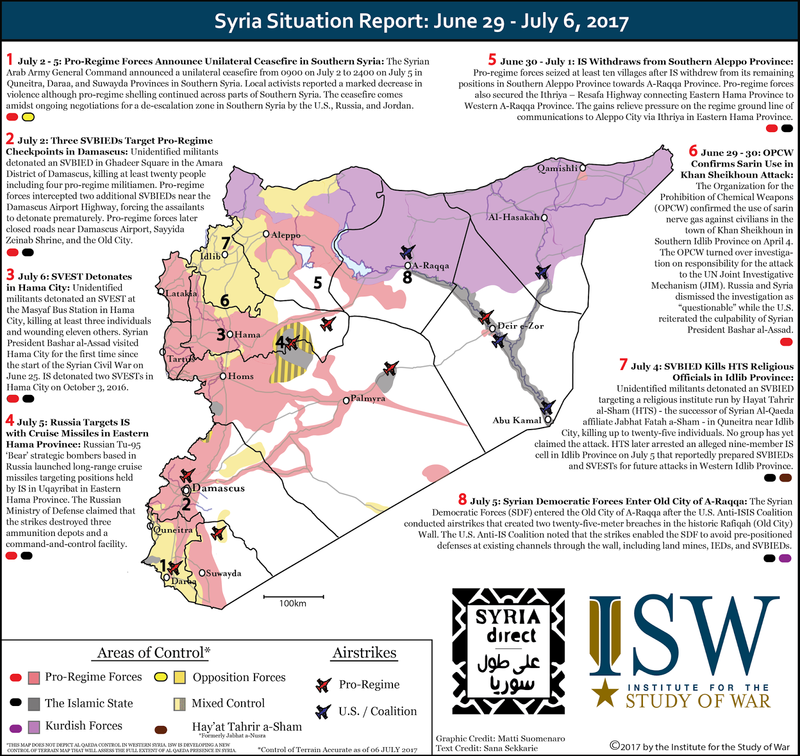 These graphics depict significant developments in the Syrian Civil War from June 29 to July 27, 2017. The control of terrain represented on the graphics is accurate as of July 6 or July 16, 2017. Key Takeaway: Ukraine’s efforts to integrate with the West yielded important progress in the past two months. Nevertheless, Ukraine’s overall pro-Western reformist movement grew more vulnerable to internal destabilization and Russian subversion. Stalling reforms, a poor economy, and an increased focus on the 2019 presidential and parliamentary elections in Ukraine provide momentum to populists and pro-Russian political elements, as well as additional opportunities for the Kremlin to exploit as it aims to return Ukraine to its sphere of influence. 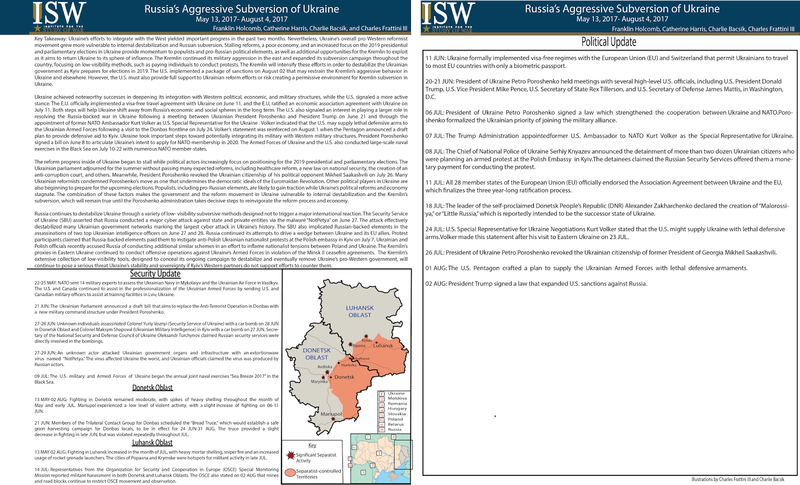 The Kremlin continued its military aggression in the east and expanded its subversion campaign throughout the country, focusing on low-visibility methods, such as paying individuals to conduct protests. The Kremlin will intensify these efforts in order to destabilize the Ukrainian government as Kyiv prepares for elections in 2019. The U.S. implemented a package of sanctions on August 02 that may restrain the Kremlin’s aggressive behavior in Ukraine and elsewhere. However, the U.S. must also provide full support to Ukrainian reform efforts or risk creating a permissive environment for Kremlin subversion in Ukraine. Ukraine achieved noteworthy successes in deepening its integration with Western political, economic, and military structures, while the U.S. signaled a more active stance. The E.U. officially implemented a visa-free travel agreement with Ukraine on June 11, and the E.U, ratified an economic association agreement with Ukraine on July 11. Both steps will help Ukraine shift away from Russia’s economic and social spheres in the long term. The U.S. also signaled an interest in playing a larger role in resolving the Russia-backed war in Ukraine following a meeting between Ukrainian President Poroshenko and President Trump on June 21 and through the appointment of former NATO Ambassador Kurt Volker as U.S. Special Representative for the Ukraine . Volker indicated that the U.S. may supply lethal defensive arms to the Ukrainian Armed Forces following a visit to the Donbas frontline on July 24. Volker’s statement was reinforced on August 1 when the Pentagon announced a draft plan to provide defensive aid to Kyiv. Ukraine took important steps toward potentially integrating its military with Western military structures. President Poroshenko signed a bill on June 8 to articulate Ukraine’s intent to apply for NATO membership in 2020. The Armed Forces of Ukraine and the U.S. also conducted large-scale naval exercises in the Black Sea on July 10-22 with numerous NATO member-states. The reform progress inside of Ukraine began to stall while political actors increasingly focus on positioning for the 2019 presidential and parliamentary elections. The Ukrainian parliament adjourned for the summer without passing many expected reforms, including healthcare reform, a new law on national security, the creation of an anti-corruption court, and others. Meanwhile, President Poroshenko revoked the Ukrainian citizenship of his political opponent Mikheil Saakashvili on July 26. Many Ukrainian reformists condemned Poroshenko’s move as one that undermines the democratic ideals of the Euromaidan Revolution. Other political players in Ukraine are also beginning to prepare for the upcoming elections. Populists, including pro-Russian elements, are likely to gain traction while Ukraine’s political reforms and economy stagnate. The combination of these factors makes the government and the reform movement in Ukraine vulnerable to internal destabilization and the Kremlin’s subversion, which will remain true until the Poroshenko administration takes decisive steps to reinvigorate the reform process and economy. Russia continues to destabilize Ukraine through a variety of low- visibility subversive methods designed not to trigger a major international reaction. The Security Service of Ukraine (SBU) asserted that Russia conducted a major cyber attack against state and private entities via the malware “NotPetya” on June 27. The attack effectively destabilized many Ukrainian government networks marking the largest cyber attack in Ukraine’s history. The SBU also implicated Russian-backed elements in the assassinations of two top Ukrainian intelligence officers on June 27 and 28. Russia continued its attempts to drive a wedge between Ukraine and its EU allies. Protest participants claimed that Russia-backed elements paid them to instigate anti-Polish Ukrainian nationalist protests at the Polish embassy in Kyiv on July 7. Ukrainian and Polish officials recently accused Russia of conducting additional similar schemes in an effort to inflame nationalist tensions between Poland and Ukraine. The Kremlin’s proxies in Eastern Ukraine continued to conduct offensive operations against Ukraine’s Armed Forces in violation of the Minsk II ceasefire agreements. The Kremlin’s extensive collection of low-visibility tools, designed to conceal its ongoing campaign to destabilize and eventually remove Ukraine’s pro-Western government, will continue to pose a serious threat Ukraine’s stability and sovereignty if Kyiv’s Western partners do not support efforts to counter them.